From Dreena Burton’s Vive le Vegan! 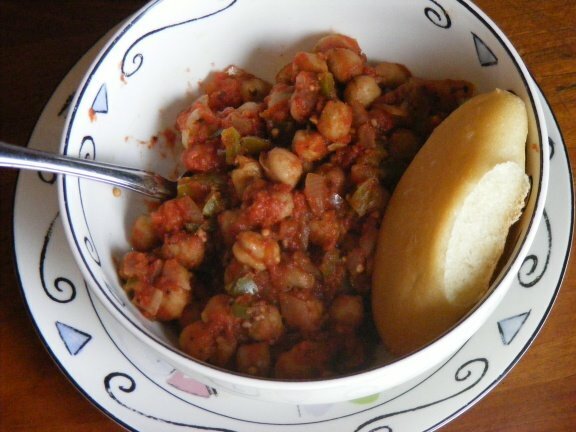 is a hearty, filling, economical and, most importantly, delicious chickpea ratatouille. If I were Cathy at Not Eating Out In New York I could even figure out the cost of the meal but I’m not, and I’m bad at math to boot. I adapted it slightly, using honey versus vegan-friendly honey substitute, and served it with Pan de Sal. Preheat oven to 400-degrees. In a large, deep casserole dish, combine all the ingredients except the bay leaves. Stir through until well combined, then embed the bay leaves in the mixture. Cover and bake for 30 minutes. Stir through, cover, and bake for another 35-45 minutes, until the onions are tender and translucent (stir through again once or twice through baking). Remove bay leaves and serve. Makes 4-5 servings or more, depending on accompaniments.